Holy Moly, what a day to be alive (and out on the Great Race) in the Northeast Summer! So much to write tonight! 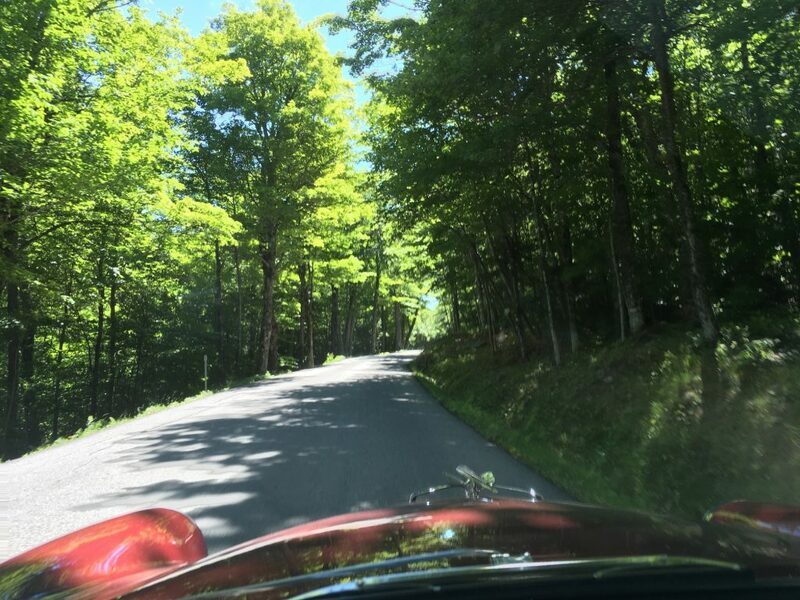 Our rally today began near Burlington, VT; ran through the GORGEOUS Green Mountains and across the river into New Hampshire’s White Mountains (quick quiz: what’s the river between these states called? Hint, it’s not the Vermont River or the New Hampshire River). The Whites are just a bit tougher: taller, sharper, stonier. 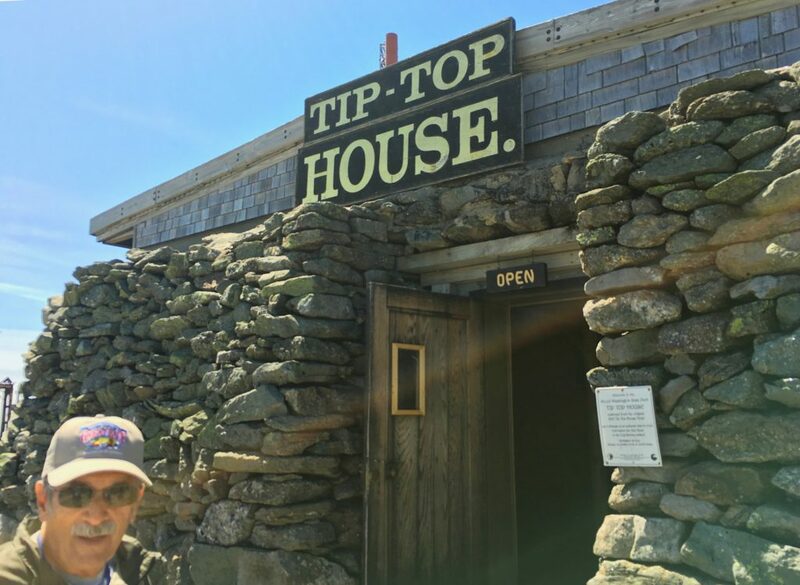 Kinda like NH is to VT overall (second side note: super comparative study here in two small states with nearly identical geology, location, history, & demography – one chose a minimalist government, the other a more active common project: VT’s income, health, and growth stats swamp those of NH. Hmmm…). But enough of that. 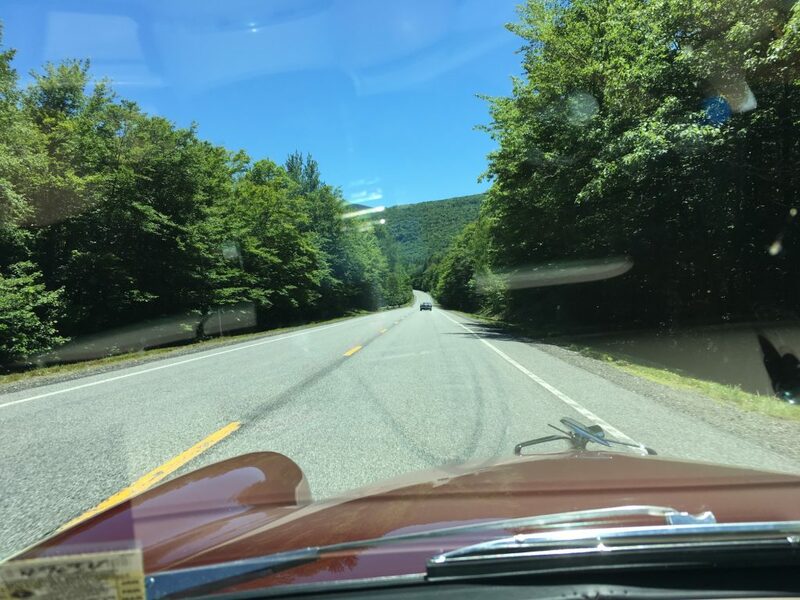 We made it through some lovely driving, all the way to Maine! With all that mountain scenery, I can offer few proofs. It was a very driver-centered day again today, but perhaps not so completely as yesterday. Dale and I are hitting our stride perhaps, with clear and effective communication and pre-planned corrective maneuvers. Nice. Yesterday we placed 23rd overall for the day and moved to 26th in cumulative scores. Today we were 8th overall, lifting us to 21st place in the cumulative ranks. Yessiree! No unforced errors, solid adjustments, and we won our first two aces. Those always look nice. Here’s a typical start scene. 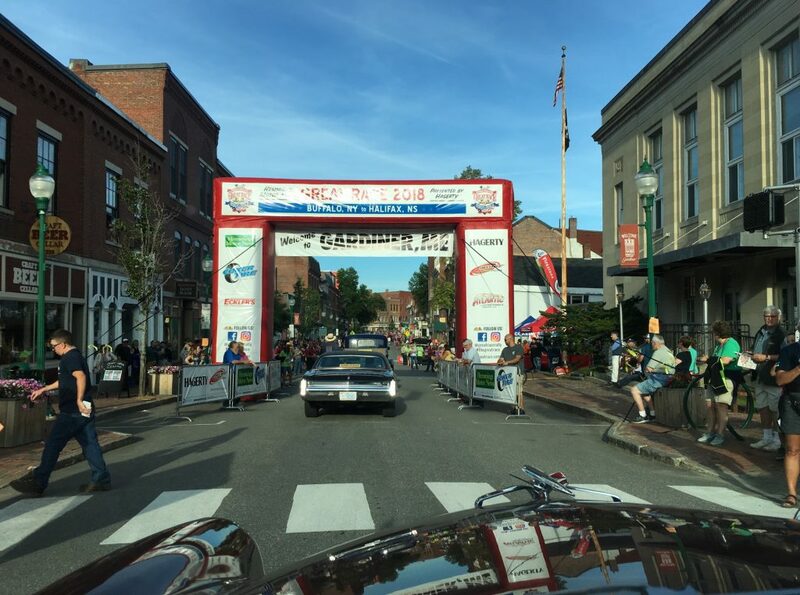 Cars pull up close to the start line (in this case a “slow traffic keep right” sign at the base of the hill ahead). There’s always some shuffling as cars rarely arrive in the exact order they’ll leave. A this start, we had the added feature of ongoing roadwork, hence the barrels. There were actually two such starts today (Hey, here in the Northeast, we have FOUR real seasons: Almost Winter, Winter, Still Winter, and Road Repair). 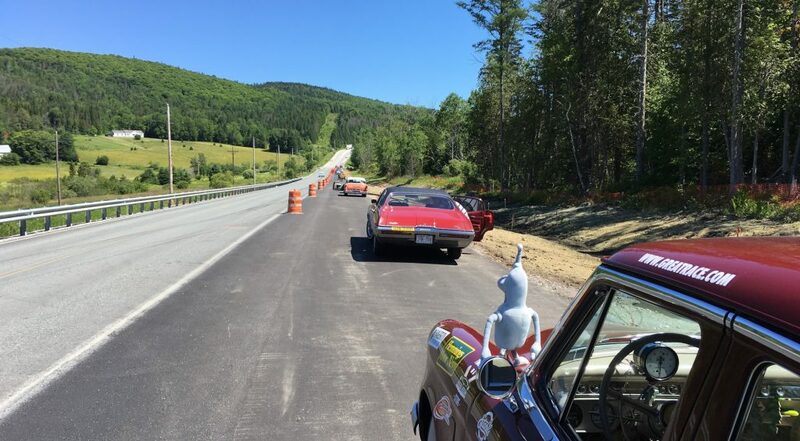 Sometimes such conflicts can’t be avoided and we do our best to cope safely (and with minimal annoyance to the road crews – Sah-ree!). Our lunch stop was at Mt. Washington, in the Presidential Range. 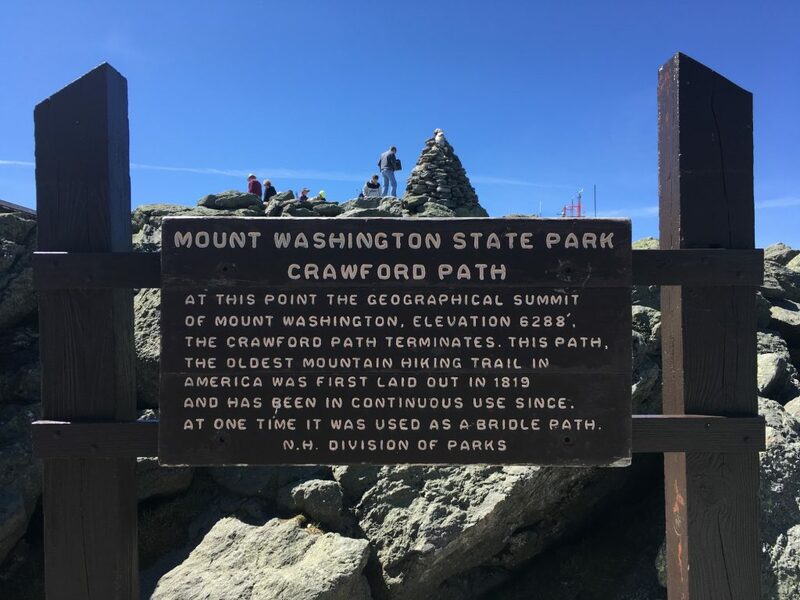 We all had the opportunity to drive to the top (and back down) – a steep trip to the 6300 foot peak from a less than 1000 foot base, in just 8 miles of windy, bumpy, narrow, but BEAUTIFUL road. All the coolest competitors took the mountain trip. Others (you KNOW who you are) thought discretion the better part of the choice, the unholy wimps! Winding up the Mt. Washington Grade, 15 mph in first gear, both up and down. 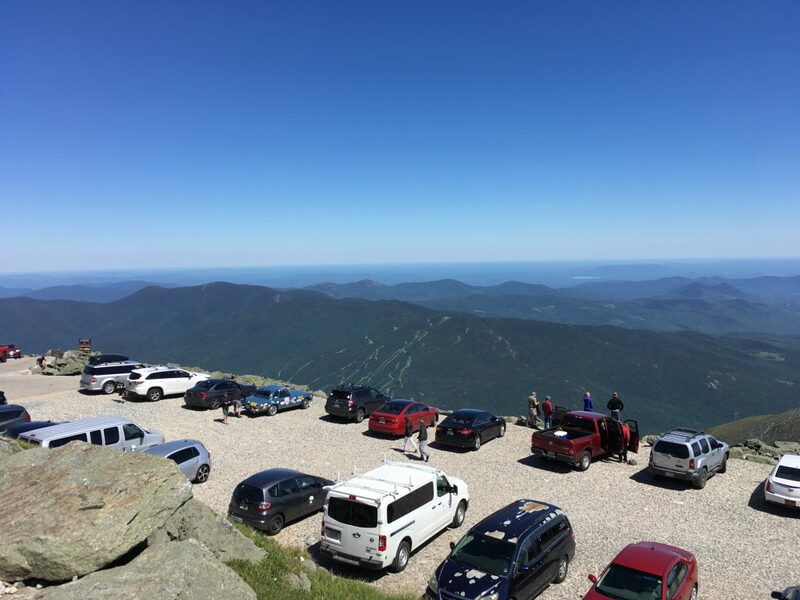 View from the very top of Mt Washington – today was a rare clear day up there! Yep, it’s a steep and high place. I have climbed this one the hard way (YEARS ago), too. 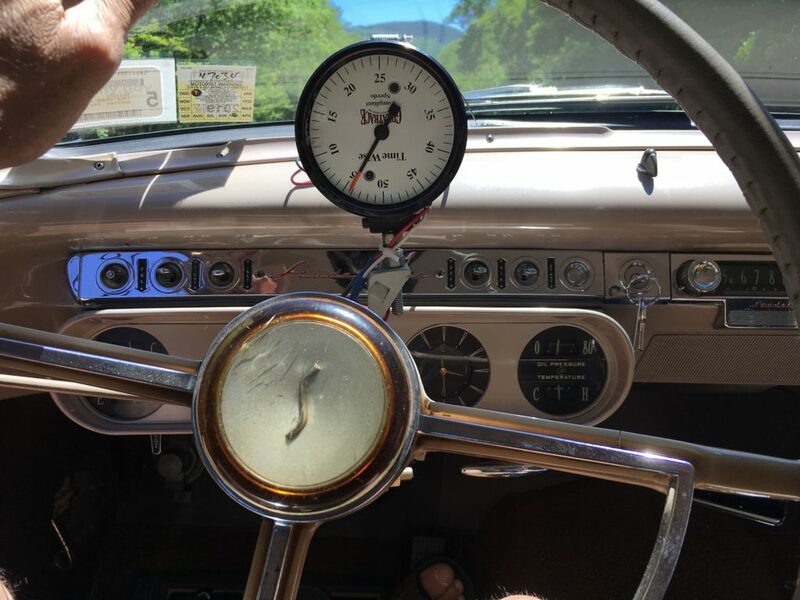 What I, the driver, see most of the time – watch that speedo to keep precise and get those aces. Dinner stop was Gardiner, Maine. Our first, at Fairport was really good. Our next, in Troy, NY was Great (if you can ignore the late deluge). Burlington after that was Beautiful. But Gardiner’s spread today was Freaking Fantastic. The street was pretty like Burlington, but with a crowd as big as Fairport and as lively as Troy (plus live music!). And they had a waterfront park filled with a summer festival – for us! 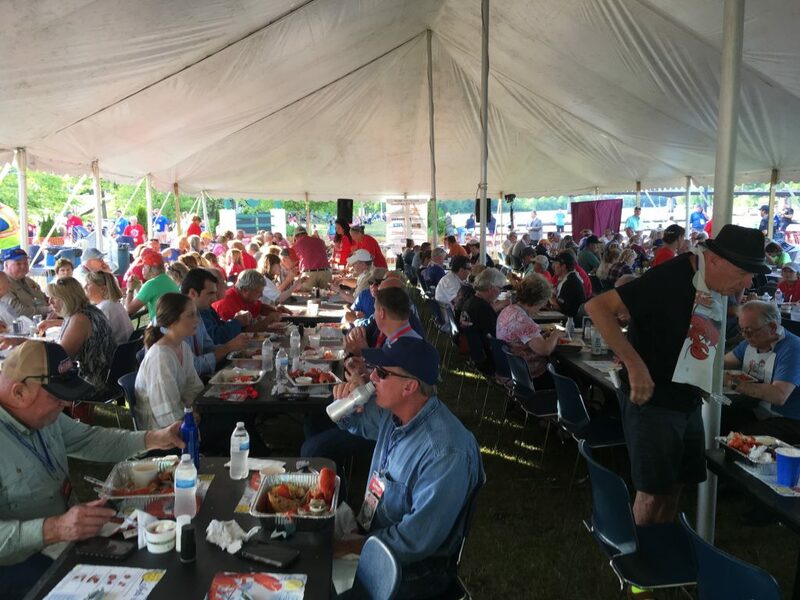 A big tent with a Lobster Boil and Clam bake! Gardiner is DEFINITELY in the lead for best evening stop. Arriving in Gardiner, ME Say, is that guy on the left doing one of the Beatles at Abbey Road? Tomorrow is all Maine all the time (and the next day, too). Was awesome evening at Gardiner. The Drivers and their team members are easily approach and have a short chats. Corky and his wife are awesome couple to chat with. Again THANK YOU for bringing EXCITING Events to Mainahh. 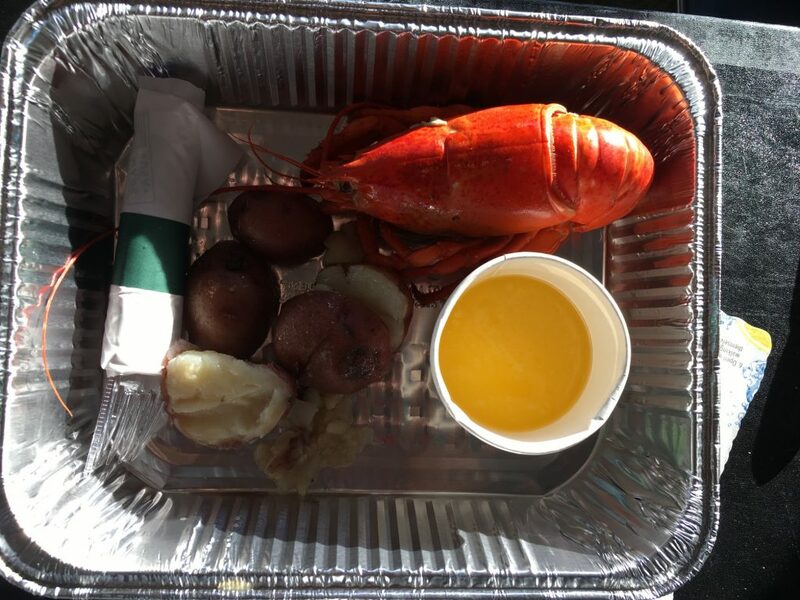 Enjoy all the LOBSTAHH while you are here.? You put on an outstanding impromptu parade that my wife and I got to watch from the comfort of our own front porch, not once, but twice as retraced your route past our home. 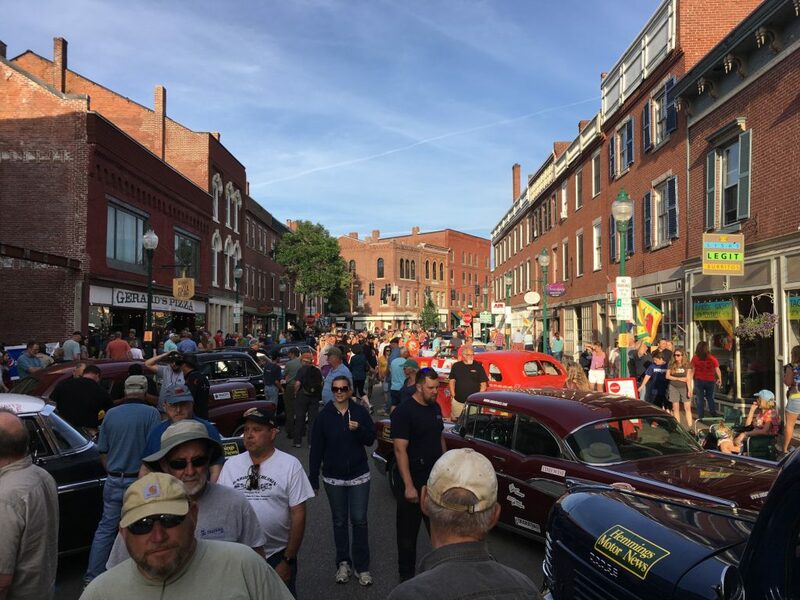 It was wonderful to see all those classic cars in their natural environment, i.e., on the roadways instead of in museums and private collections or as static displays at car shows.